A strange package showed up at my house a couple of days ago. Having not placed an order in recent memory, the weird box from a company I never heard of was quite worrisome. Well, I had forgotten that my friend in the U.K. mentioned something about sending out a package to me containing a glorious purchase I had placed and paid for months ago when I was still employed. Of course, the image header spoils the give away already but my copy of Ni No Kuni has finally arrived. 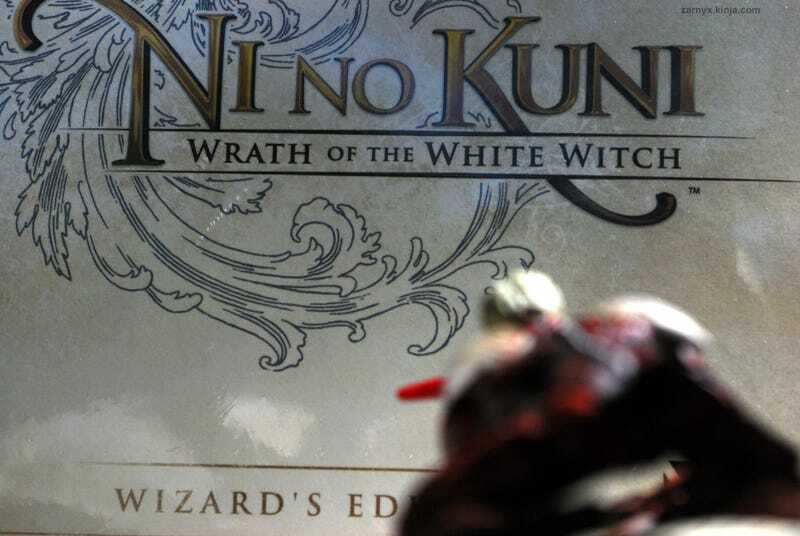 After waiting far too long to secure a copy from Namco Bandai, I had no choice but to order my Wizard's Edition from Amazon UK. Having it in my hands now, I am glad I put the order down, even if it feels as though I'm late to the party. I've been actively avoiding spoilers and articles on this game for months. I actually did not expect to be playing until October of this year and so this is quite a pleasant surprise. You see, I have this personal code where I refuse to start a new game on a console if I'm already involved in playing another on said console. As I was sitting here pondering what I really should be doing with my life, it occurred to me that I've broken this code before. While pining away looking at my copy of Ni No Kuni, I thought to myself that there was no way I could start up a play through because I currently have three outstanding games I've not yet finished. And if I really think about it some more, I'm certain there are a couple of games that I've downloaded on the PSN that I may have started and not yet finished. Though, I don't really count those. But now I'm just making excuses, aren't I? I used to pride myself on this code. For the most part, I've done well to stick to it over the years. I will allow myself to play a game on the PS3 while subsequently playing one on whatever handheld. There's nothing unacceptable about that in my mind but even then, I tend to stick to one game at any given time whether it be a console or handheld game. Being that I mostly play JRPGs, it's a relatively easy code to live by. With in-depth story telling and the nature of the JRPG to usually be time consuming, a good game will keep me entertained for weeks on end (I go at my own pace and like to take my time, alright?!). That style of game play and involvement makes it that much harder for me to divide my attention. I know I've spoken about it before but when I was younger and without my own means to purchase games, my games felt more like treasures and I played maybe one or two a year. See that Shadowy thing up there? My code stemmed from those early years and has allowed me to truly enjoy my games one at a time, while subsequently keeping me happily deluded into thinking that I am diligently working on my backlog. But here I am with a beautiful copy of Ni No Kuni to play but I am feeling guilt as I have equally as important games to finish on my PS3. I cannot exactly betray Valkyria Chronicles since I am half way through it and it deserves my utmost attention. I also really have no excuse to not finish Lollipop Chainsaw considering I'm right at the final boss. And maybe if I were feeling a tad smarter these days, I could figure out that puzzle on the 5th night in _Catherine _and move on with my life. I Finally Finished Ni No Kuni! When the end credits started playing I got really excited, because there were vocals to it. However, it seems as though my problem has been solved as my sister confiscated the game and started up a play through of her own. Oh, by the way...if I told you I actually do not think there's any way I am actually going to finish _Breath of Fire IV _before Animal Crossing's launch, would that net me an additional 25 years of community service in the dungeon if I started playing New Leaf? Moral Code? What moral code? That thing slipped out of my being within the last three years, apparently and I only now just noticed. ...and with the focus shifted, I believe I've been found out. I will be taking my leave now. Lurking over on TAY Classic are fantastical beasts, conversations about life, video games and anything you desire. A Hunting Manual was issued by TheUnfathomableTruth that is proving to be quite useful on the in and outs of TAY. Use it and be careful out there. Announcement: Animal Crossing is less than a week away! If you wanted to join in on the fun, why not share your friend codes with the TAY Community? If that's not your thing, we're sharing our other Gaming Ids too. Join us!